This affordable 3 bedroom home located in central south Shepparton would suit first home buyers or investors. The open plan design features dishwasher and walk-in pantry in the kitchen which overlooks the dining area and large family room (7m x 6m) with air conditioner, ducted gas heating and 9’ ceilings throughout. The second living area could also be used as a fourth bedroom. There’s also a decked pergola area (5m x 3m), shed (6m x 5.5m) with air conditioner, wood heater & fixed benches and good size/secure front & backyards. 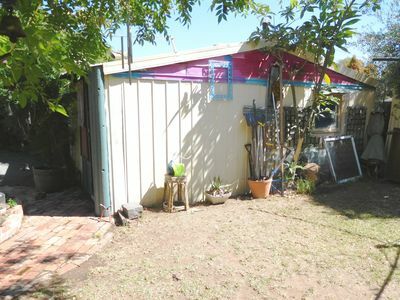 This home would suit a handyman or someone looking for a small project to bring it back to its former glory. Claw foot bath in bathroom. Decked pergola with pull down blinds.